McLeish Handed League's Easiest Start? McLeish Handed League’s Easiest Start? I’ve had a more detailed look at the Premier League fixture list, released last Friday, to just how happy new Villa manager Alex McLeish should be with the start to his league tenure at Villa club, and the answer is…. very happy! Having made the switch from fierce rivals Birmingham earlier this month, McLeish admitted in his opening news conference as the clubs new boss that there will be extra pressure on him, as there is with any new manager, to hit the ground running. The fact that there is still a large section of the Villa support who oppose the recent appointment may well mean that if the Scot cannot start well, he may struggle to win the fans round for the remainder of the season. However, the fixture list for the 2011/12 season must have made pleasant reading for the new man, with Villa being one of only two sides, the other being newly promoted QPR, who will not face a top 6 side in their opening 7 matches of the Premier League. Not only do they avoid the ‘big 6’ but McLeish’s side have also steered clear of the wrath of the sides new teams in the opening two months of the season, with slip ups to the likes of QPR, Norwich and Swansea all but inevitable early on in the campaign. Without a doubt McLeish’s biggest game of the opening 7 comes just 3 weeks in, when his second game in charge of the side at Villa Park will see the club face Midlands rivals Wolves with a derby victory being a sure fire way to win over support and defeat leading to quite the opposite. A decent start always means an absolute shocker of a middle or end and next season could be set to emulate the last with the month of December promising to be a very hard one, meaning Villa fans should gear up for a miserable Christmas and a crappy New Year. In the six match filled month, Villa face Man United, Liverpool, Arsenal and Chelsea, as well as tough matches away at Bolton and Stoke. Ouch! 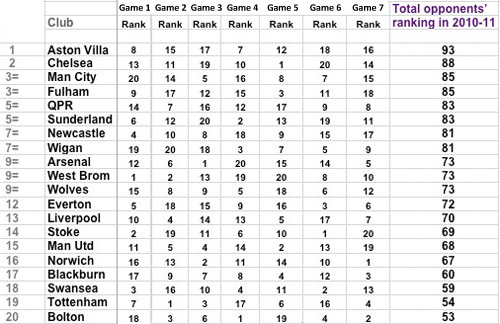 However, if Villa are firmly in the top half by then it may be in no small part to the beginning of the season. According to SportingIntelligence, the club have the easiest start, followed by Chelsea and Manchester City, based on the combined strength (or lack of strength) of their opponents. By ’strength’ the analysis uses last season’s finishing positions to judge that. 3 Comments on McLeish Handed League’s Easiest Start? The fixtures have been kind to Eck or unkind in the fact that there are so many must win games. If he isn’t winning there are no excuses and fans will be after his blood. We’ll have only played Man City and Spurs who have any credibility by the end of Nov. By my generous calculations we should have 20/39 points by end of November. December is going to be very painful. I’m more concerned about what players we will have. Wish the club would come out and clear the situation regarding Downing. I think I disagree with you. McLeish has been handed the most difficult start. Recall that Villa has in the past seasons performed well against the “Big 4”. Now that he has been handed the “must wins” first, which have always been a pain to Villa, he has been trapped. He will have no excuse if he loses. I consider that PRESSURE.